Set of 4 tumblers in hand blown glass with sterling bands on the top. 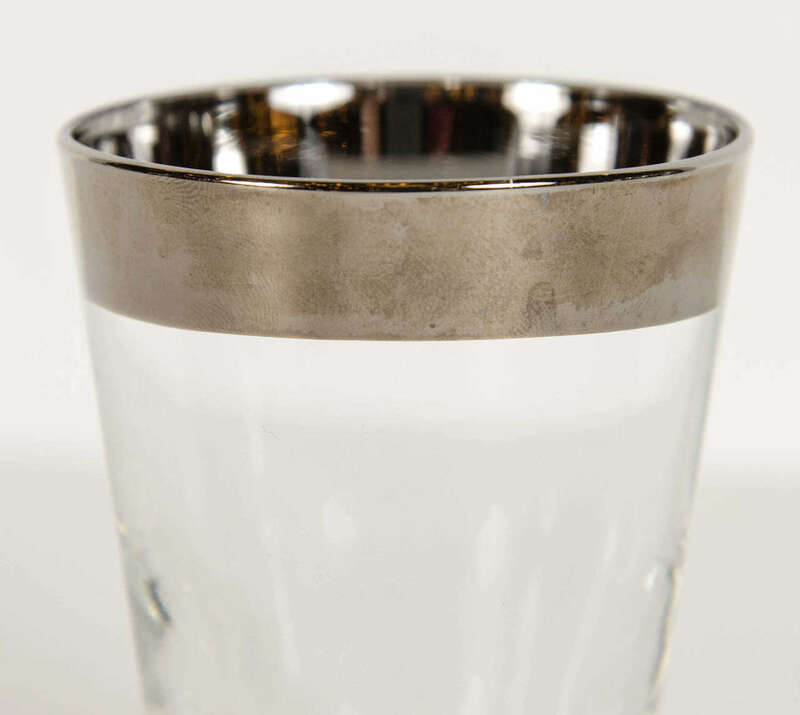 Dorothy Thorpe glassware was a chic staple of every mid-century modern wet bar, paricularly her festive Roly Poly silver-banded tumblers. Although not as widely known as such contemporaries as Eva Zeisel and Edith Heath, Thorpe was one of a group of creative and entrepreneurial women whose designs captured the imagination of the postwar homeowner with her modern and festive designs. Thorpe was born in Salt Lake City in 1901 and settled in Los Angeles as a young woman. She began creating her signature glassware using the trade name Dorothy Thorpe Originals in the 1930s. Thorpe was a designer, not a glassblower. To create her shimmering wares, she purchased glass blanks from a variety of manufacturers and subjected them to various techniques, including sandblasting, etching and silver overlay. Initially Art Deco in style, the pieces were signed with a large T and smaller D. Thorpe also worked in ceramics and, in the 1940s, with Lucite, producing a line of household items, such as magazine racks, sculptural lamps, candlesticks and umbrella stands. After World War II, Thorpe was inspired by the new interest in the flowers and animals of the South Pacific to begin incorporating tropical floral motifs into her work. She traveled to Hawaii and studied local irises, roses, azaleas, narcissus and eucalyptus. The decorative patterns based on these studies were created primarily by sandblasting, which makes a glass surface appear frosted. From the 1930s through the ’50s, Thorpe’s designs won her many fans among the members of café society, including Princess Grace of Monaco and the Shah of Iran. They were also widely imitated. 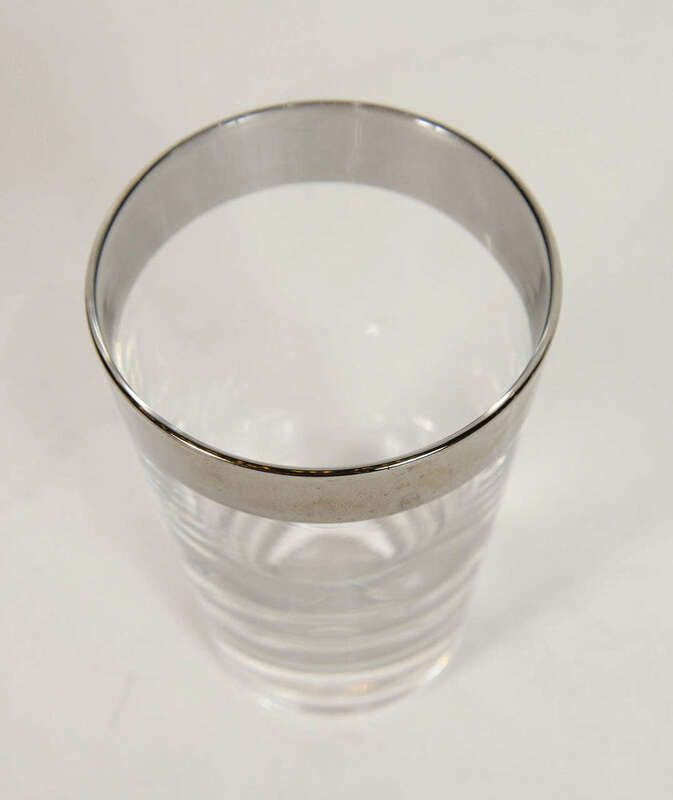 Vintage tumblers that bear a silver stripe around the rim but lack the “DT” signature on the bottom are not Thorpe originals. 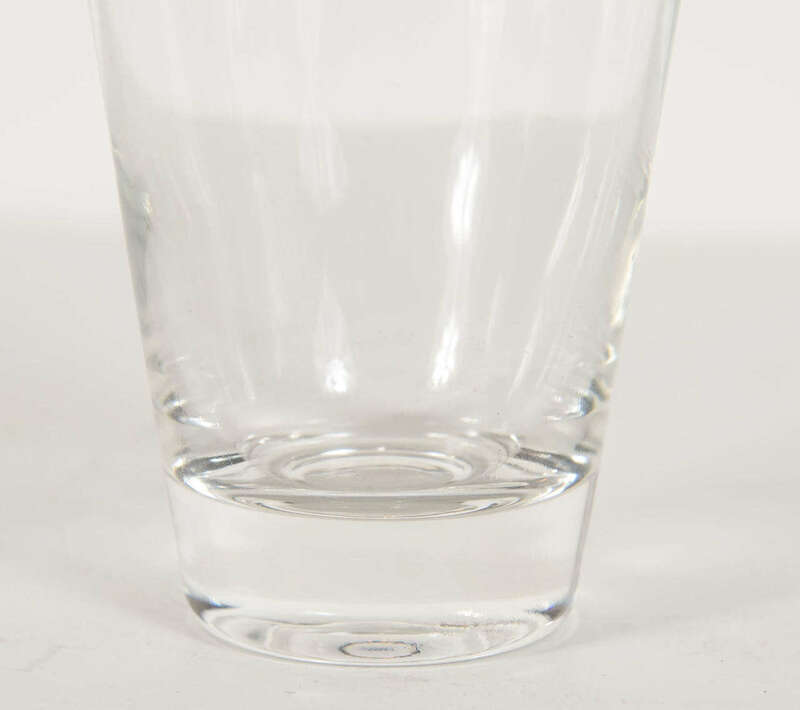 In the 1950s, Thorpe created the glassware line Atomic Splash, which featured the energetic geometric patterns that were so popular at the time. 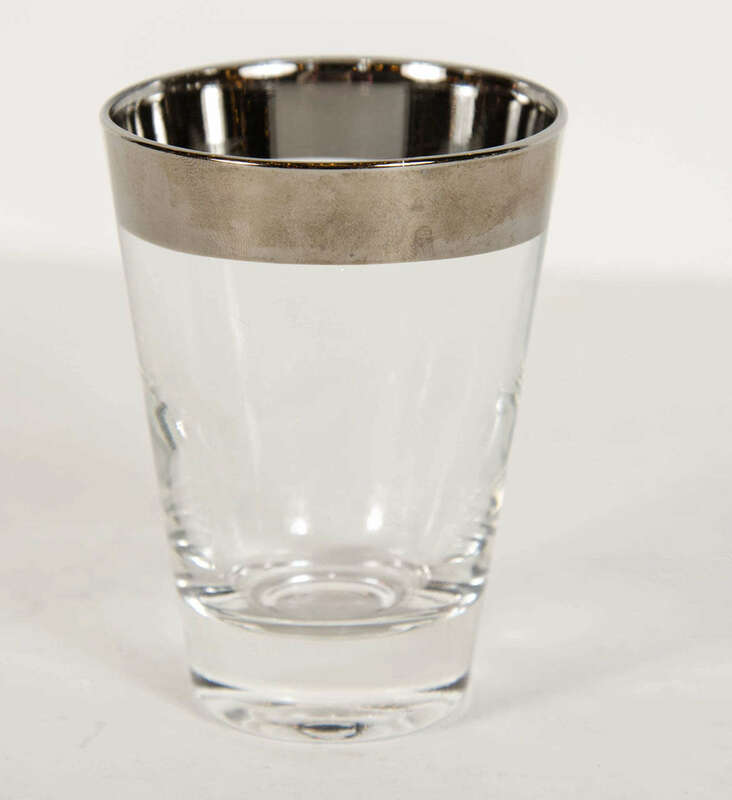 Atomic Splash patterned drinking glasses and serving dishes bore a silver overlay that evoked an explosion. She also designed a line of ceramic tableware decorated with a wreath of spring flowers in collaboration with Crown Lynn Pottery, in New Zealand, and, in the mid-’60s, created coffee sets for the Santa Barbara and Monterey companies. Among her own ceramics products were lines glazed iin the eye-catching shades Orange Persimmon and Blue Periwinkle. Midcentury Dorothy Thorpe set of 5 stemware glasses for wine or cordial. 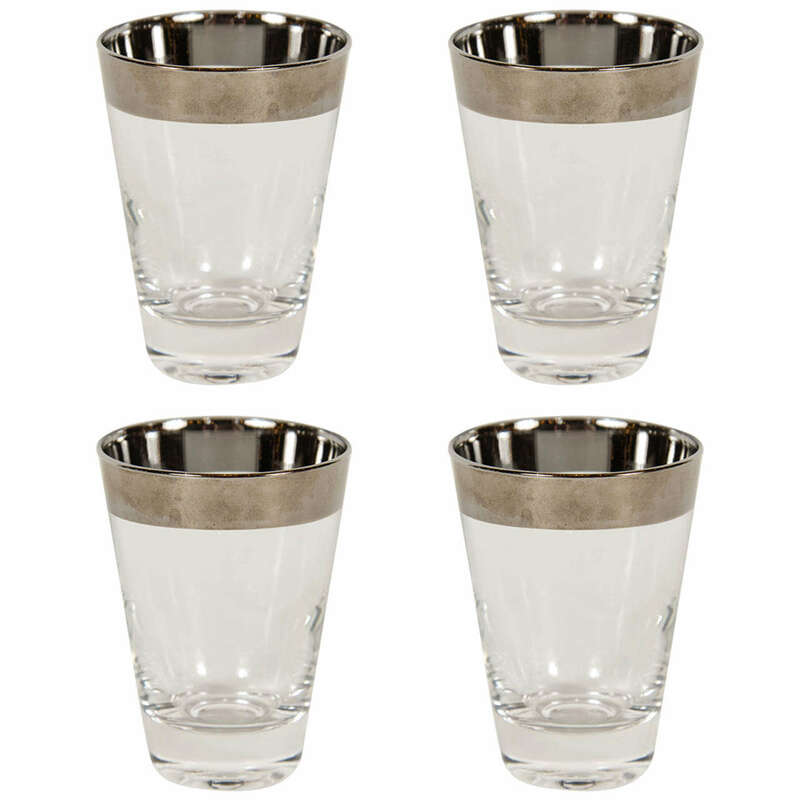 Vintage mid-20th century modern 1960s Dorothy Thorpe set of eight silver fade highball glass tumblers. Offered are a set of four Mid-Century Modern Dorothy Thorpe silver overlay "Tom Collins” cocktail glasses. Midcentury silver glass bar set attributed to Dorothy Thorpe. Silver Fade. 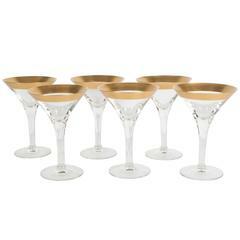 One martini pitcher 10.5 x 3 inches One glass stirrer 12 inches Six glasses 3 x 2.25 inches.